One of at least seven models that Hamilton commissioned Bill Blass to create, this one is the “Columbia” model as in reference to the United States. 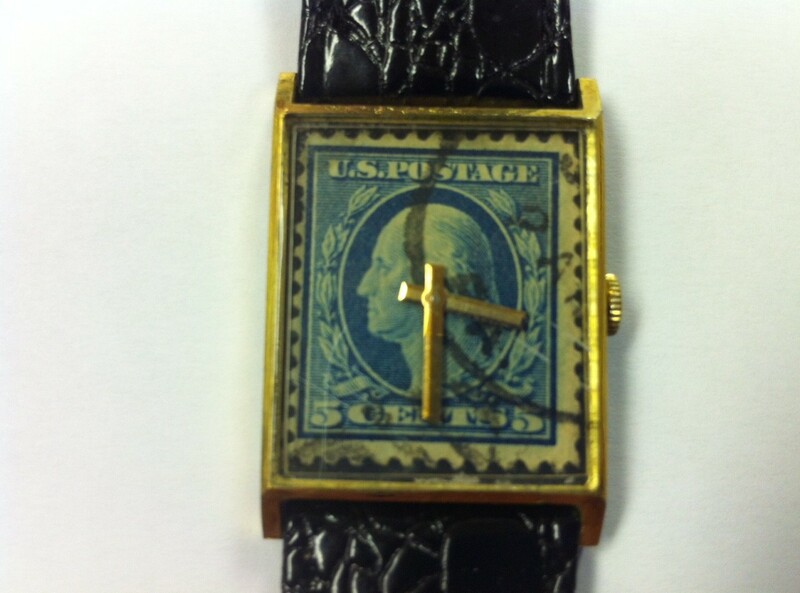 It features an authentic blue 5 cent George Washington Stamp as the dial, and has two plain gold tone hands, hour and minute. No hour markers. The rectangular case has angled lugs and a nicely knurled crown. This men’s watch is a good size for the time, at 25 mm wide by 38 mm north to south including lugs. The 1970 fall line of watches from Vantage, a product of the Hamilton Watch Co., was previewed to the press June 26, 1970, in New York City. Designed by Bill Blass, the watches were made with 17 jewels movements to work as beautifully as they look. This entry was posted in Vintage Wrist Watches. Bookmark the permalink. I have this watch and I want to find out what it is worth. Please! It is the Columbian of the Bill Blass Hamilton collection it looks better than the one above. Please note my reply to your other question. While I am not a watch appraiser and this should only be taken as an opinion, watches of this design sell for a wide range of prices depending on where you shop for them. I believe there is one listed on eBay now for about $100.00 which is a good estimation of value.